I'm having a play day! The fall is always an exciting time around the shop. New people, new yarns, new classes and lots of ideas and plans. It is a time when I get overwhelmed and hardly feel like I can knit or crochet. I woke up this morning feeling pretty overwhelmed by it all. What's the thing to do when overwhelmed? Steady yourself by playing with yarn of course, and that is exactly what I am doing. I picked big needle projects so that I can feel a sense of accomplishment. New yarns so that I will be doing something productive for the shop(sorry really the class list will be up soon!). My first project was the Katia Evita yarn using the free pattern they have online. Smashing sucess with those little fur balls. I can tell you that if the little fur balls start to congregate, you can easily slip them along the yarn so they are scattered more. 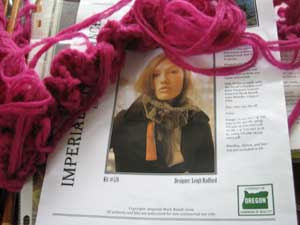 I am right now working with the Imperial Stock Ranch 2 pencil roving. It is taking some time to get use to it. I started this project once before and realized that I needed to get to know the art of knitting with the pencil roving better. I am flying along on this project and will devote one whole posting on tips for working with this fiber. 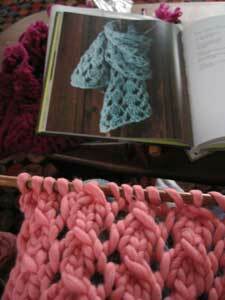 The other scarf that I started today is the Big Lace Scarf from More Last Minute Knitted Gifts. I'll show you the finished projects with specifcs at another time.